Great American Cookie: Get a free cookie Saturday between 10 am and 2 pm! 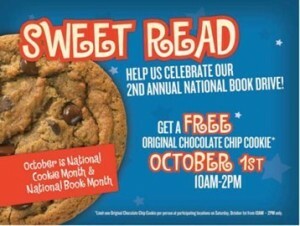 Great American Cookie is kicking off their Reading is Sweet: 2011 National Book Drive with a FREE Original Chocolate Chip Cookie giveaway on Saturday, October 1st, from 10 am to 2 pm! Stop by your local location and enjoy a FREE cookie. Plus throughout October, customers can receive a free cookie of their choice by donating a new or gently read book at their local Great American Cookies store. All books collected at each store will be offered as a donation to a local branch of the public library or a local charity.